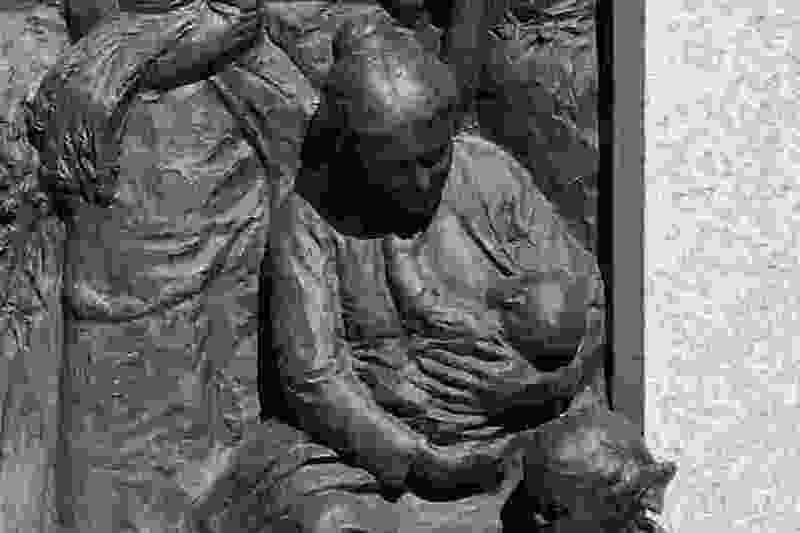 (Rick Egan | The Salt Lake Tribune) A nursing mother on one of the panels of the Sea Gull Monument on Temple Square, just east of the Assembly Hall, in downtown Salt Lake City, Friday, July 27, 2018. The northern Utah mother at the heart of a spat about public breastfeeding has reached a “compromise” with her LDS bishop: She’ll now wear two tops to help hide her breast from above and below while nursing her 19-month-old daughter at her Mormon meetinghouse. But the dispute isn’t dead. The woman is “not quite ready,” she said in her first audio interview on the matter, to meet with the LDS leader who denied her a “temple recommend" unless she covered up. “I would like to see [LDS authorities] put out a policy worldwide, throughout the whole church, to protect mothers, to make it so that women can breastfeed their babies however is comfortable for mom and baby — whether that’s covered or not covered,” the woman said Wednesday on The Salt Lake Tribune’s "Mormon Land” podcast. The woman, who agreed to go by the initials S.D. because she hopes to resolve the impasse with her clergy, also addressed misinformation that has sprung up in the viral venting since her story surfaced. Carrie Stoddard Salisbury, the Exponent II blogger who exposed the controversy, said on “Mormon Land” that hundreds of women have agreed to write letters to the faith’s top female leaders calling for a consistent, female-friendly policy on breastfeeding.